MOTECH allows you to integrate with OpenMRS - an open source enterprise electronic medical record system platform. This is done using the OpenMRS-19 module, that communicates with OpenMRS through its REST API and exposes OSGi services which allow your implementation to easily integrate with OpenMRS. Refer to the module documentation for information on using the API it exposes, this document will describe setting up integration between MOTECH and OpenMRS. You can easily configure the OpenMRS-19 module to integrate with MOTECH, and then use its API to retrieve or manipulate data in OpenMRS. MOTECH uses the REST API exposed by OpenMRS for integration and it will require HTTP access to OpenMRS and an account with rights to the operations you wish to perform. Take note that the module was written with OpenMRS 1.9 in mind, and we will use that version for reference in this tutorial. Again, refer to OpenMRS documentation for more details. The MOTECH OpenMRS-19 module exposes a configuration file called openmrs.properties. This file is registered with the configuration system. Based on what configuration mode the system is configured with, you can change the settings either by using the Admin UI(UI Mode) or the file in the config file location(File Mode). You can modify this file through the UI by clicking Admin > Manage Modules > Click the gear icon on the right of the OpenMRS module. The default username and password match the defaults from OpenMRS(make sure that you change these in production environment). openmrs.identifierTypes By default, we support the one identifier type specified in openmrs.motechIdName property. Define additional identifier types here if you need to create or query an OpenMRS patient with multiple, custom identifiers via MOTECH (comma separated, if more than one). The module must be restarted in order for configuration changes to take effect. Finally, enter the details of the identifier type. The name must match the one in the openmrs.motechIdName setting variable. You can specify the settings as you wish, note that for example making locations required or adding a regex format for the identifier will restrict what values you can use. Refer to the OpenMRS documentation for more information. MOTECH communicates with the OpenMRS via REST, which means that the OpenMRS instance must have a Rest Web Services module installed and activated. You can find the required module on the OpenMRS modules website. Pick the latest released version (2.9+) and download it. You can install the module using OpenMRS UI. Go to Administration tab, and select Manage Modules. You will see the Add or Upgrade Module button. Click it, then select the downloaded file under “Add module” and upload it. The module will be installed and started. 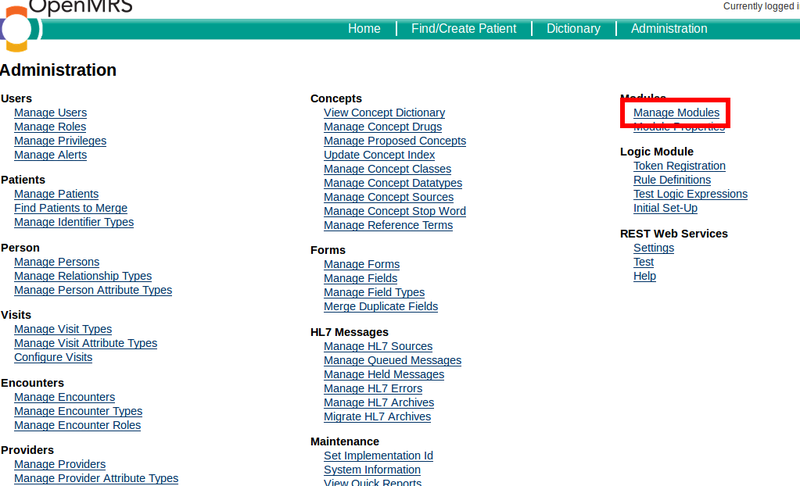 You can verify its status in the Manage Modules section. You should now be able to use the OpenMRS-19 module. Refer to the module documentation for usage instructions. © Copyright 2015, Grameen Foundation. Revision f979c999.